Lavonn was a stay-at-home mom. Her twins were born prematurely and their medical problems required special care. Before she’d had her twins, Lavonn enjoyed doing clerical work for her uncle’s restaurant. She’d also thought about working in medical administration. So when she found out CCC had a Business Office Technology program, she knew that was where she wanted to be. At first, Lavonn was scared. She was uncomfortable around large groups and older than she expected the other students to be. But she soon felt at home on campus, where she met a lot of adult learners just like herself. She even met her current employers at a CCC job fair. Lavonn was months away from graduating and the company, Pathway to Choices, wasn’t even looking for someone with her skills. They were on campus to find caregivers the adults with physical and developmental disabilities that they work with. 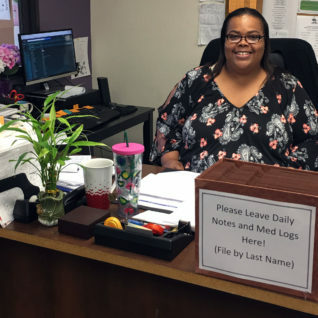 But after getting to know Lavonn a little, they decided to create an Administrative Assistant position for her. They worked around her school schedule and, after she graduated, expanded her job. “They ended up needing me more than they thought,” she says. They also value the skill and experience Lavonn brings to the company. They listen to her thoughts and opinions, and have implemented a number of changes that she’s suggested. Now, Lavonn’s life will never be the same. Her time at CCC has helped her better the lives of herself, her children and many local people with disabilities. Her message to people who might be considering CCC or the Business Office Technology program?